This was a real treat of a find today, and I was quite lucky to stumble across it in all honesty. I was taking my usual travels to come across something unique/different that I could showcase and I had remembered I was going to research sculptor Michael Coffey but never got around to it after seeing a selection of work on the Wright auction site. Once I had dug around a little I discovered Bespoke Global and their collaboration with Michael Coffey on a video, since they seem to be well connected with the artist and sell some of his work. Michael is actually quite a renowned maker based in Massachusetts and he’s someone who’s work sells for a lot of money and commands high biddings at places like Christie’s and Sotheby’s. To be honest it’s well deserved since he’s been working with wood for over 40 years now and is what they call a ‘master woodworker’. Michael goes through the process of handcrafting each piece by hand but is a self-taught artist which is something that’s fascinating to hear. For some reason this makes it all the more exciting when I see his work and he must have been through lots of ups and down to get where he is today, a real achievement. One thing that probably drew me to his work as well was the fact that he’s got quite a close style to George Nakashima who has been on our tongues quite a lot this week, and we’ll shed more light on that at a later date. I can definitely see some parallels but overall Michael has a unique sense of style and has made some forms that are very mind boggling to look at, most of them don’t look possible to be produced out of wood. As you watch this video below you’ll get a definite sense for his dedication to his craft and the way that he produces, I also found that he’s very good at explaining his feelings, something that’s not prominent in all craftsman. When you go on his blog page that’s linked below for example he gives a quick summary of each of his thoughts under the different items that he’s produced. 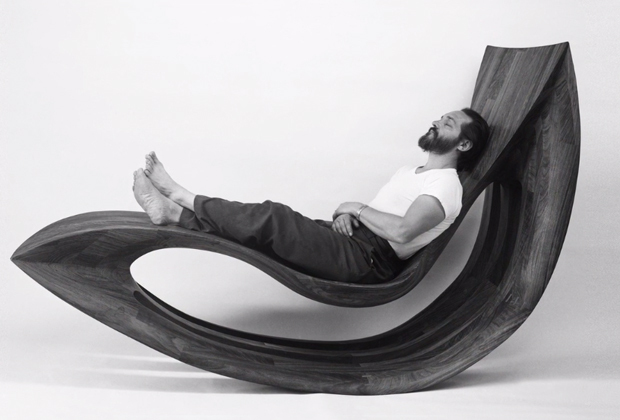 Although the site hasn’t been updated in a fair few years it’s quite timeless in terms of design and he sheds some light on his feelings towards sculpture, furniture, and other big items made out of wood. Hopefully in the video you’ll spot a mixture of miniatures that are made to showcase what a piece would look like in a bigger format (3.40 in to the video), how great would it be having a mixture of these laying around the workplace, they look fantastic! Hopefully you enjoy this piece below and maybe it will inspire you to go and find out more about Michael Coffey, his life, and his works.